It would be a mistake, not too take this group seriously. 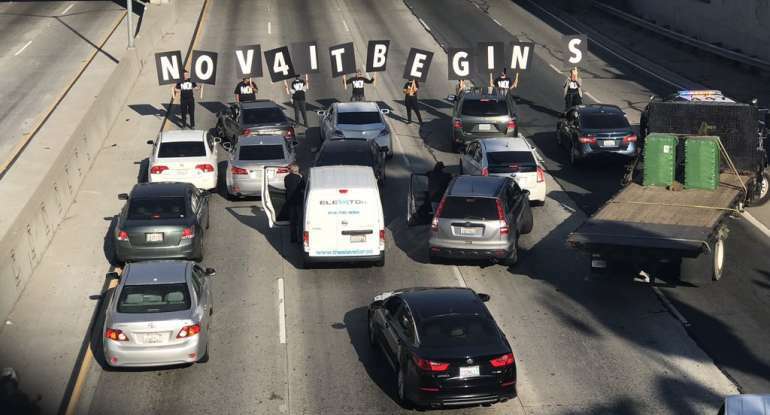 If they do show up on Nov. 4th all around the nation as they claim, I would expect it to be another "Occupy Wall Street" but with much more violence, and better funding. I would also expect the Trump administration to send in Feds, and not put up with it the way Obama put up with OWS. Antifa is probably more dangerous, better funded and deadly serious than most are aware. For excellent info on this radical communist group, click here. On August 22, 2017, Paul Joseph Watson over at Infowars, also reported on the planned actions by the two groups listed above, stating "Alt-left agitators are planning to stage mass riots in major cities on November 4 during which they hope to instigate a “civil war” that will lead to the “regime change” of the Trump administration." All one has to do is look to the timeline of Antifa groups violent uprisings from January 2017 to August 2017 to see rioting, arrests, physical attacks, property destruction and more, all instigated by black clad and masked individuals who are part of the "umbrella" Antifa groups, those calling themselves "anti-fascists," yet use fascist methods to silence anyone that disagrees with them. Before getting into the latest attempts by the media to whitewash the violent methods and tactics used by Antifa groups and their plans for November 4, 2017, a quick reminder of the definition of a civil war, via Merriam Webster: "a war between opposing groups of citizens of the same country." It is absolutely no stretch of the imagination to call what we have been witnessing or what these Antifa groups are planning for November, a "civil war," as visual evidence by way of video after video is all over the internet of these violent thugs attacking free speech rallies, conservatives speakers at colleges, rioting on campuses and causing hundreds of thousands of dollars in property damages just to prevent someone from speaking because they don't like what the person has to say. Yet according to Newsweek, PBS and others, any claim that Antifa is planning a civil war or a revolution to overthrow our duly elected government, is "false news," and a "right wing conspiracy," despite the little pesky fact that it is in their stated goals and on their websites, and fliers. The Newsweek article came out on October 11, 2017, where they claim "This story, which can be found across social media, sometimes attached to the hashtag “#CivilWar2017,” is not only utterly fake, it’s also potentially dangerous, according to half a dozen left wing activists who spoke to Newsweek, expressing concerns that it could inspire senseless violence from people who believe it to be true." What is actually happening on November 4? A protest is being launched by the activist group Refuse Fascism, which is intended to stir a non-violent mass movement to remove Trump from office, according to Perry Hoberman, a professor at the University of Southern California who is a member of the group’s steering committee. The idea is to mobilize people to hit the streets in a peaceful demonstration against Trump’s administration, Hoberman says, stressing that it has absolutely nothing to do with starting another American civil war. Non-violent? Can anyone name off the top of their head, a protest which involved any Antifa group that was not violent? Coincidentally, when I noticed that nowhere in the Newsweek article did the writer bother to actually quote what was written on the Refuse Fascism site itself about the nationwide planned "protests," I went to my original article to find the exact quote that is shown at the top of this article , clicked over to the Refuse Fascism page where I first obtained it, and whoaaaa, got a page 404 error, the content was no longer there, but that is the beauty of archiving sites, because the original content of that age, is still online. According to the Newsweek writer, who appears to be an Antifa supporter or sympathizer, one of the members of Refuse Fascism was "concerned about how the conspiracy theory could inspire people to commit acts of violence against protesters." Hoberman, who opposes fascism but certainly does not seem to fit the image of a masked “antifa” activist as depicted on InfoWars, says he’s concerned about how the conspiracy theory could inspire people to commit acts of violence against protesters. “Of course we’re worried,” Hoberman says. Coco Das, who is part of Refuse Fascism’s Austin, Texas chapter, tells Newsweek that her group has received reports from other activists “that armed militias are expected to counter” its protest in the city on November 4, and insists that the group is completely non-violent. Completely non-violent? Refuse Fascism is on record supporting Antifa groups and offered criticism against Nancy Pelosi after an incident in August where even Democrats had to denounce the violence associated with Antifa. In a report from 2016, the FBI and the DHS had warned that Antifa's activities were considered "Domestic Terrorist Violence." As Stefan Stanford highlighted just days ago, law enforcement members are completely aware and preparing for Antifa's November 4th plans, with one Deputy sheriff warning, "if you are white or a Trump supporter, you're a Nazi to them and it will be 'open game' on you." Let me help the Newsweek writer out a little bit, these Antifa folks are not concerned the "conpriracy" could inspire violence against them, they are scared to death of the fact that now that their "revolutionary" plans have been publicized to the masses, innocent Americans are prepared to defend themselves against Antifa's violence. Which brings us to the main complaint from PBS Newhour, who calls Antifa's plan for civil war "false news," as they complain that if you search Google for "Antifa November 4," and "Antifa civil war November," the top results actually inform the public what Antifa is planning, which PBS says "confirms this conspiracy theory." They even provide screen shots! 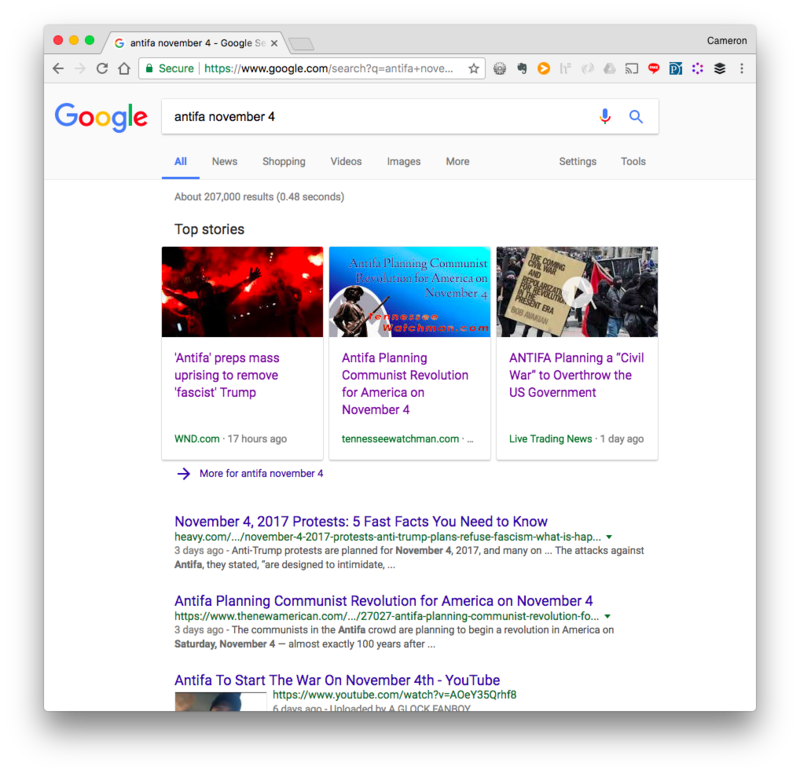 I almost thought the piece was satire, but they are completely serious in their outrage that when people search for what Antifa is planning for November 4th, *GASP* they can actually find the information. 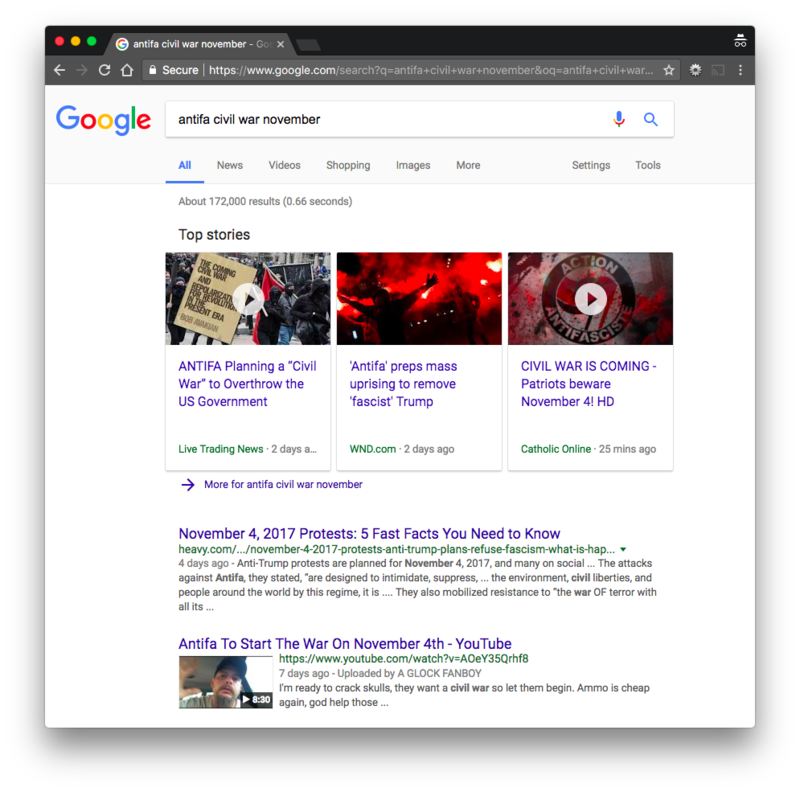 Each and every media outlet that are attempting to downplay the potential for Antifa instigated attacks on November 4th, especially given their documented violence since January, by claiming anyone that tries to warn the public of their stated plans is perpetuating a "conspiracy" or reporting "false news," should be held accountable if Antifa does start nationwide rioting. The only silver lining here is the scheduled November 4th activities have become so publicized that many communities and people are prepared to defend themselves, their families and neighborhoods, and now Antifa knows it. That ladies and gentlemen may be the only thing that prevents bloodshed.